Some combinations of ingredients meld together to form magical taste treats. 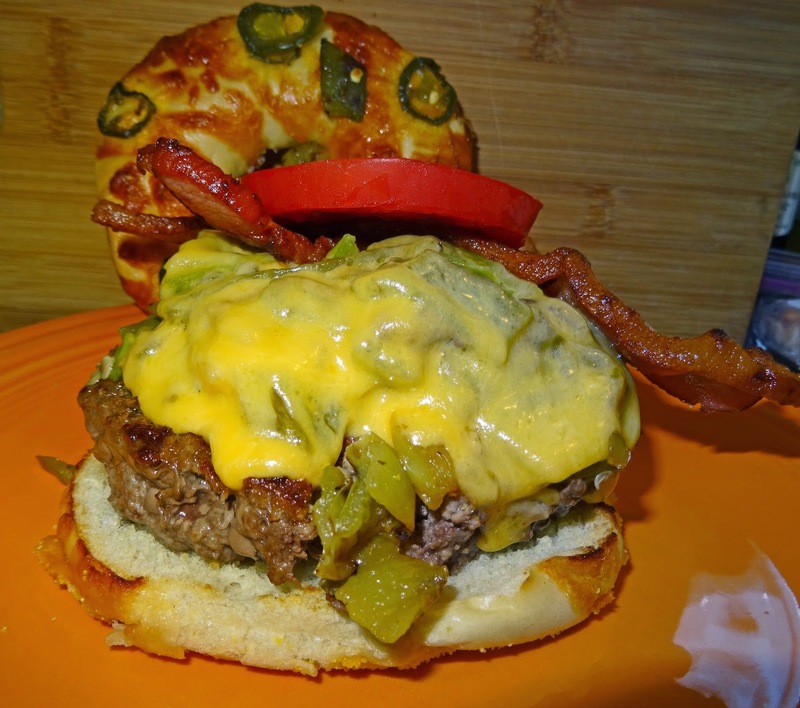 The combination of bacon, tomato,freshly roasted green chile and cheese topped on a burger is a marriage made in heaven. We cooked this beauty on our flattop. 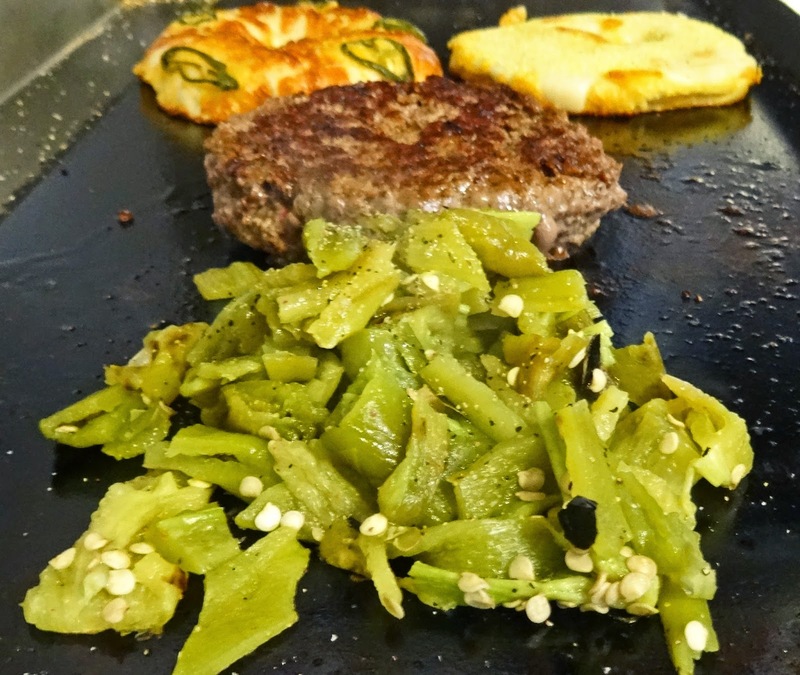 We seasoned and briefly heated the chile before placing on our burger. Some home made mustard was brushed on a jalapeno roll. A tomato that was still warm from the garden would be the garnish to propel this burger to stardom. It does not get any better. 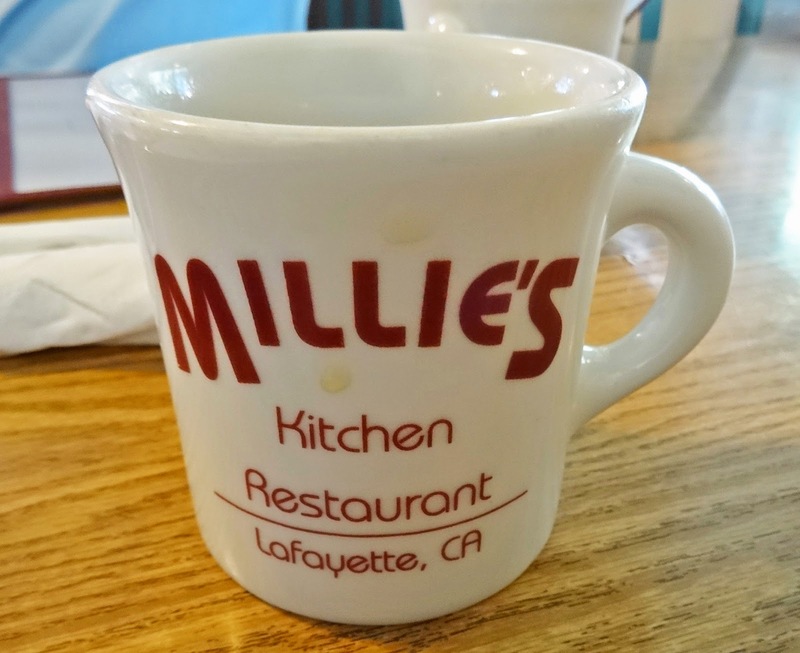 Millies's is a very popular breakfast hang out in Lafayette, California. This was our meeting spot with a fellow retired salt mine worker for a cup of Joe and to further the search for the best pork chops ever. Millie's is an old house that has been converted into a restaurant.. The parking lot is small and fills up quickly. The parking karma remains demonstrated by the spot waiting for me in front. We did feel lucky to be seated right away. 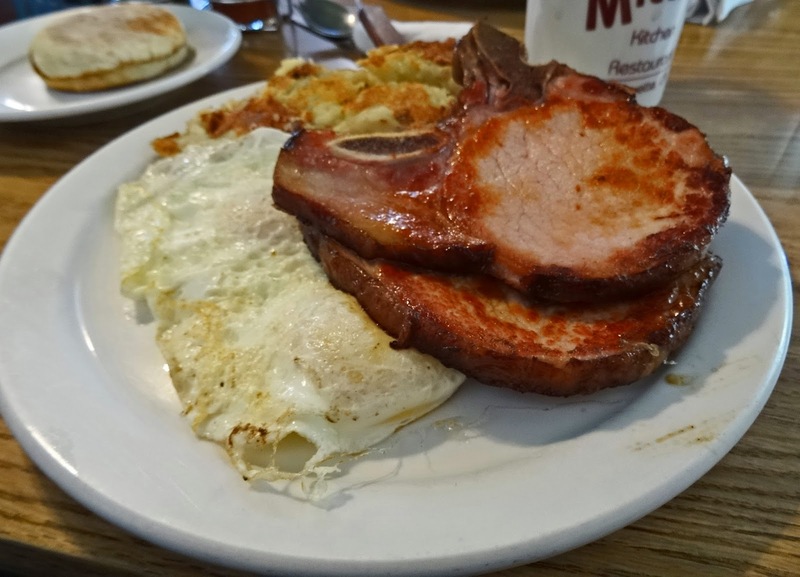 The signboard advertised the special of pork chops and eggs, so the table was set. Our server was prompt and cheerful. Overall, the chops were okay and the rest was pedestrian. 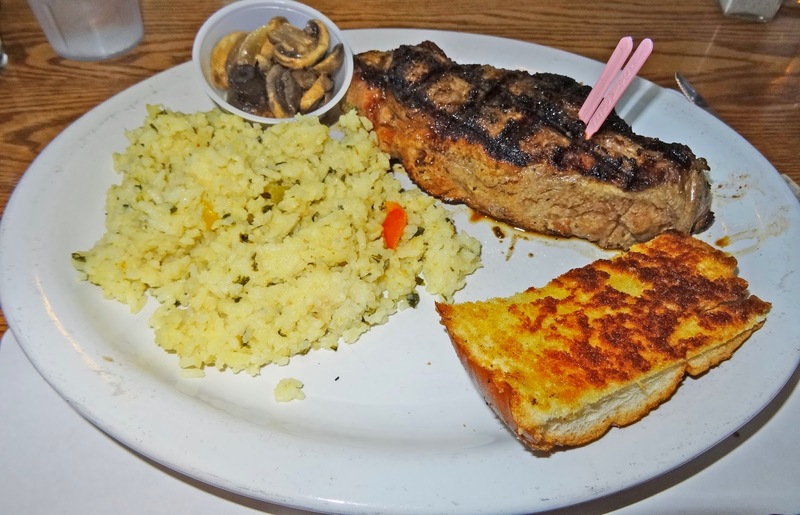 Millie's is a popular dining institution in Lafayette. I personally do not see what the breakfast eating population of Lafayette sees. The search continues. 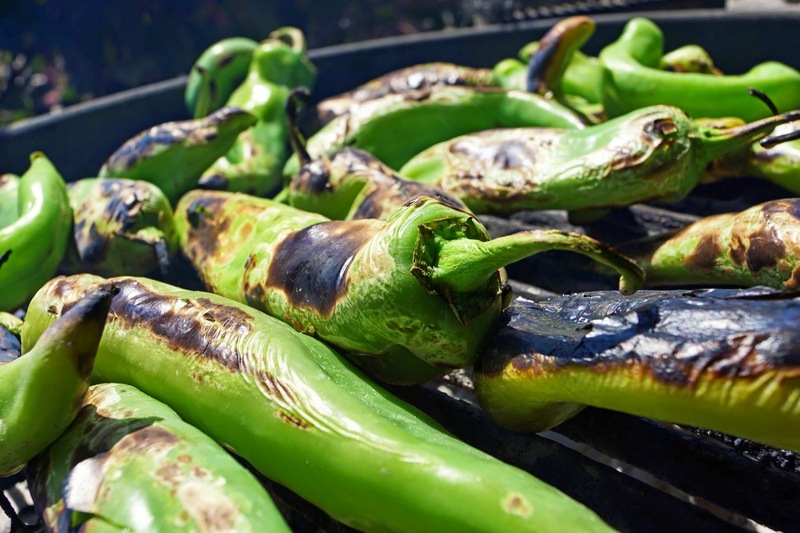 For several weeks a year the New Hatch Green Chile's roll through town for a short visit. These are the 'Gold Standard' of the green pepper game. We have our Anaheim s and Long Hots but the New Hatch are just something special. These peppers have a cult like following of fans. 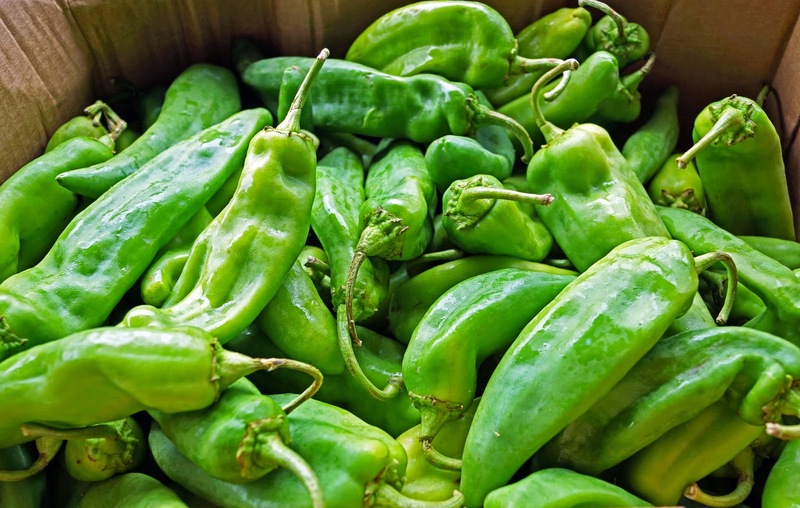 Anybody from the Southwest or a fan of Tex-Mex foods knows the magic these peppers bring. In the past we needed to be diligent to find these peppers because only a select few markets would carry these peppers. Now for several weeks a year almost every market will stock them. 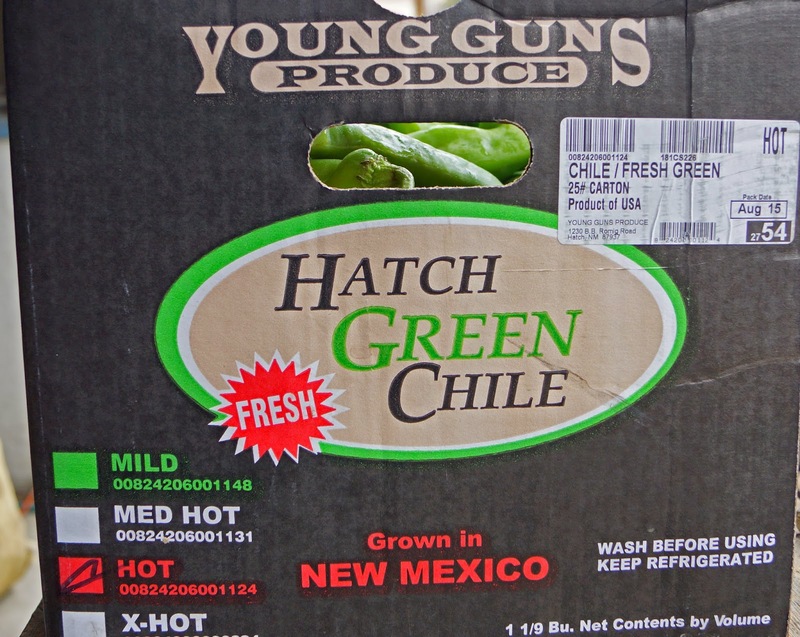 Our local market finally has the New Hatch Green Chile. I picked up 10 pounds of peppers at 99 cents a pound. The produce manager and I were talking about the ways of cooking and roasting of these peppers when he just happened to mention that I should buy a case. He also made me an offer that I could not refuse. (.70 cents/pd). With a 25 pound case under my arm it was time to get roasting. Roasting 25 pounds of peppers sounds like a daunting task but is quit easy. We roasted them on our Weber kettle over a very hot mesquite charcoal fire. The idea is to blister the skin. You are not trying to cook them. A couple of turns on the grill and they will blister quickly. They are stacked on a sheet pan to cool. This method steams and loosens the skins for easy peeling. We portion them out and place them in ziploc bags. They are then put in the Chilebrown ice cave for future use. These peppers are so tasty. This case was marked hot and they delivered. We now have a great base for salsas, eggs, chili-verde, and so much more. We are happy. Bella Vista California is a small rural community located 10 miles east of Redding. We have never heard of Bella Vista until now. It is the location of the 'Dry Creek Station. This is a local restaurant and bar that you have driven by your entire life and have always wanted to stop. Our in-laws John (he still will not let me ride his Harley) and Shastina took us to this local watering hole. This is the kind of place we love. Let's all go to the bar. This a local hang out that was packed this happy hour time. We grabbed a table for our libations. The waitress brought us an appetizer menu that was loaded with items that gave the deep fryer a workout. The zucchini strips were ordered because of their reputation as being the best ever. They were. To the main dining room we went for a steak dinner. The dinner menu showcased steaks at very reasonable prices. This was a meat and potato kind of place, in fact vegetables were not offered with the entree. A small salad did come with your meal. 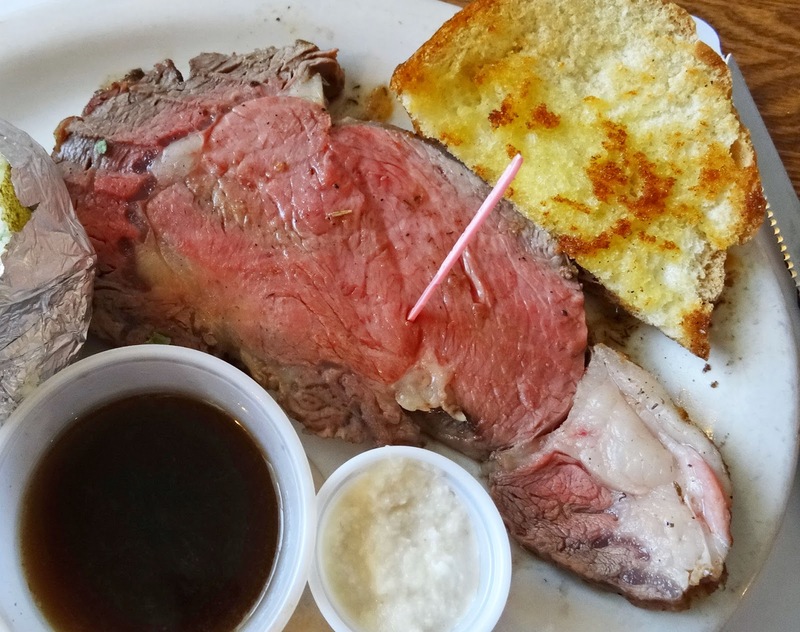 I enjoyed a New York and Ms. Goofy prime rib. The steak was very decent, a tad overcooked for my liking but I finished all 16 ounces. 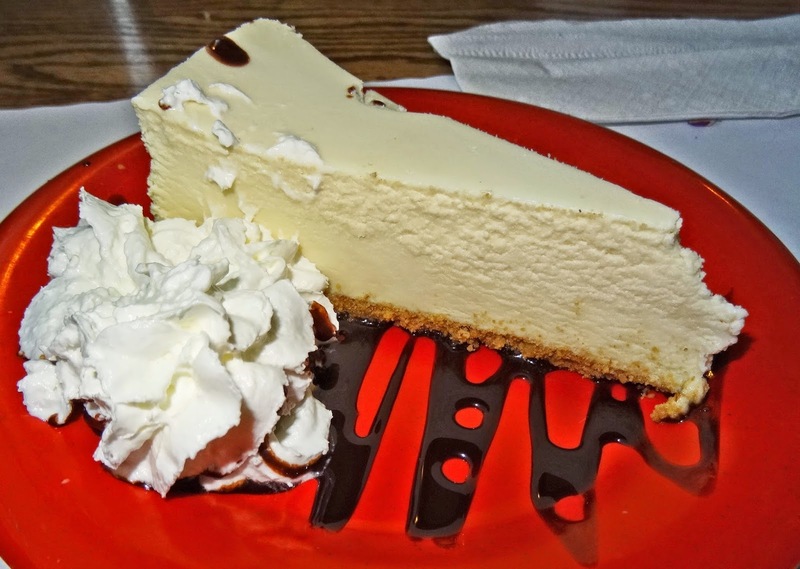 I even had room for a piece of cheesecake. It seems that America is turning into a giant strip mall that chain restaurants control. 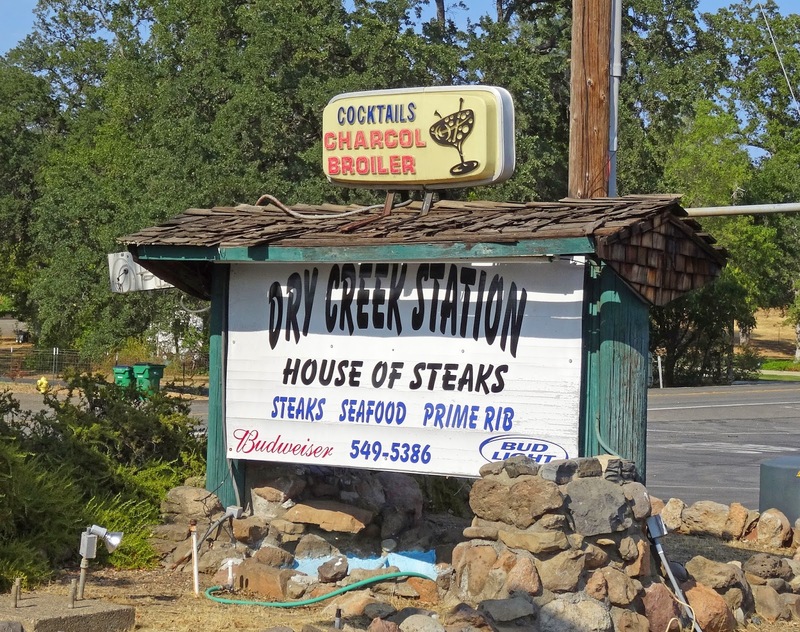 Dry Creek Station is a refreshing wonderful place to grab a cocktail and dinner. The locals from Bella Vista have a gem to be proud of. I know the suits are sitting around the conference room asking; 'How can we get Chilebrown to buy our products?'. The answer is simple. Bacon is the magical carrot that I follow. Will the bacon explosion of products ever end and do I want it too ? Every once in while a bacon themed product is a winner. Today we have two bacon products that I could not resist. Bacon chips and a candy bar with bacon is on the table today. 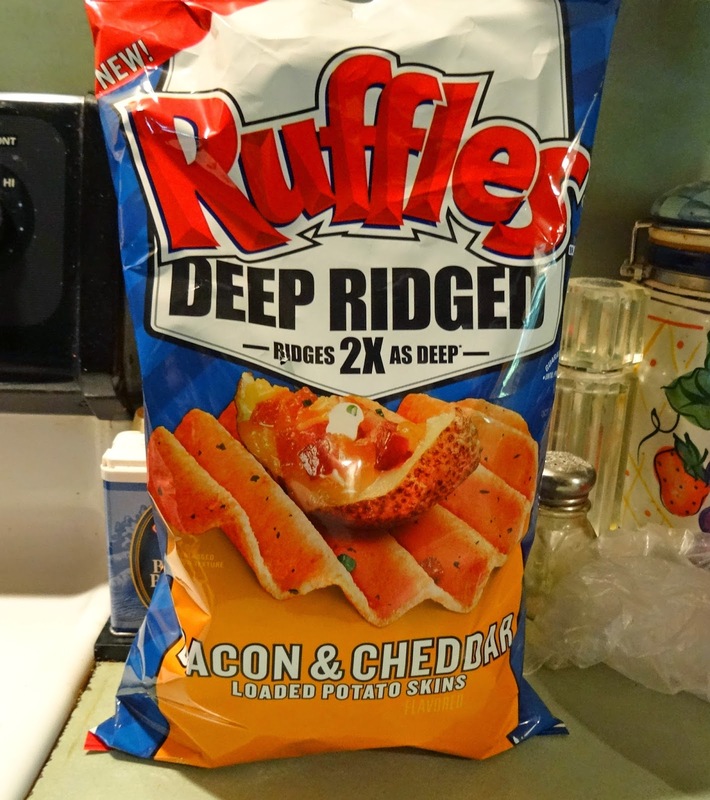 I am not sure if you can ever improve the addicting, salty, crisp original version of Ruffles. The addition of bacon flavor tickled my curiosity but did not ring the bell. They were decent enough but the original is still my favorite. 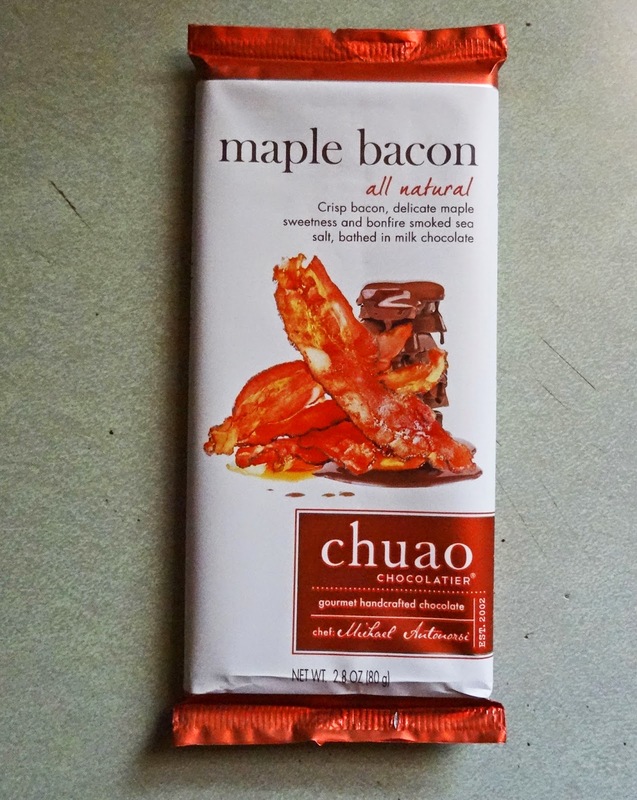 The next product was a chocolate bar with bacon pieces throughout. 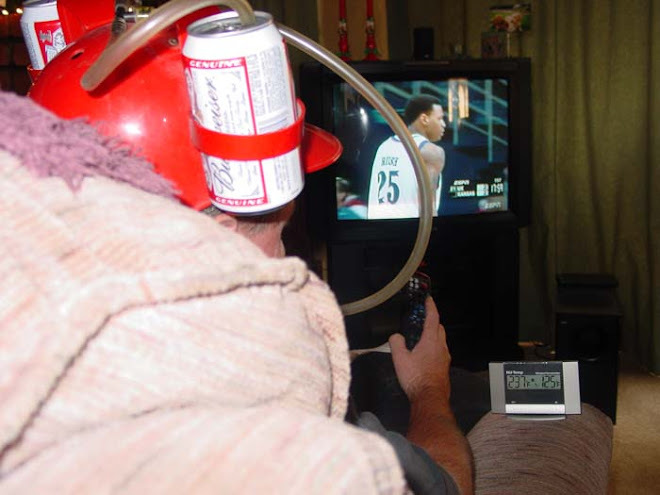 This was a hands down winner. The salty crunchy, maple bacon added a nice touch to the premium chocolate bar. We will purchase this chocolate again, in fact we already have. I wonder what the next bacon themed products will be? Ms. Goofy has two favorite guilty food pleasures. Chicken wings and blue cheese are two food items that makes her tail wag. We have found a wings sauce from 'Original Juan's' that combines these two ingredients.This may be a marriage of ingredients made in heaven. The great thing about this sauce is the convenience and simplicity of preparation. Season, cook, and coat wings with sauce. That is all.she wrote. Let's cook some wings. We cut the wings in half and removed the wing tip. Our favorite rub of the day dusted and coated our wings. To the Chilebrown Ice Cave for a short rest of several hours. 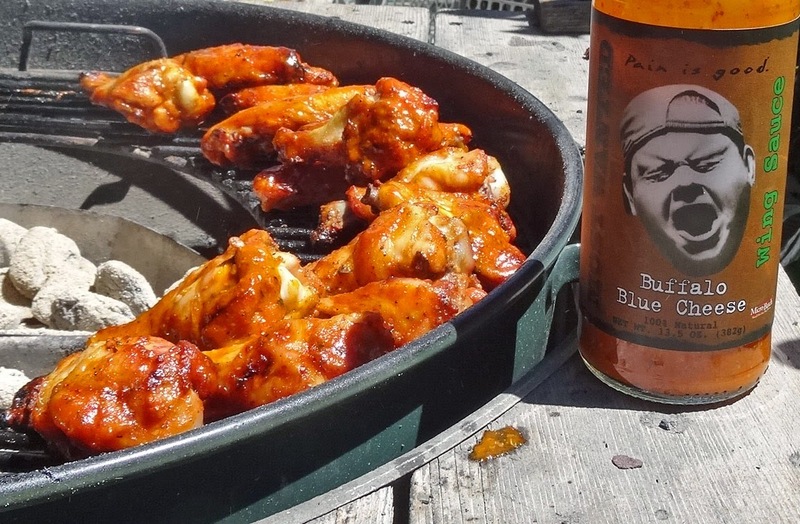 An indirect charcoal fire in our Weber kettle will bake these wings for one half an hour. Some blue cheese wing sauce was poured into a bowl. The cooked wings were placed in the bowl and tossed. We then place the coated wings back on the heat for three minutes to set the sauce. Easy, peasy. It was time to eat. These wings did have a pronounced blue cheese flavor. 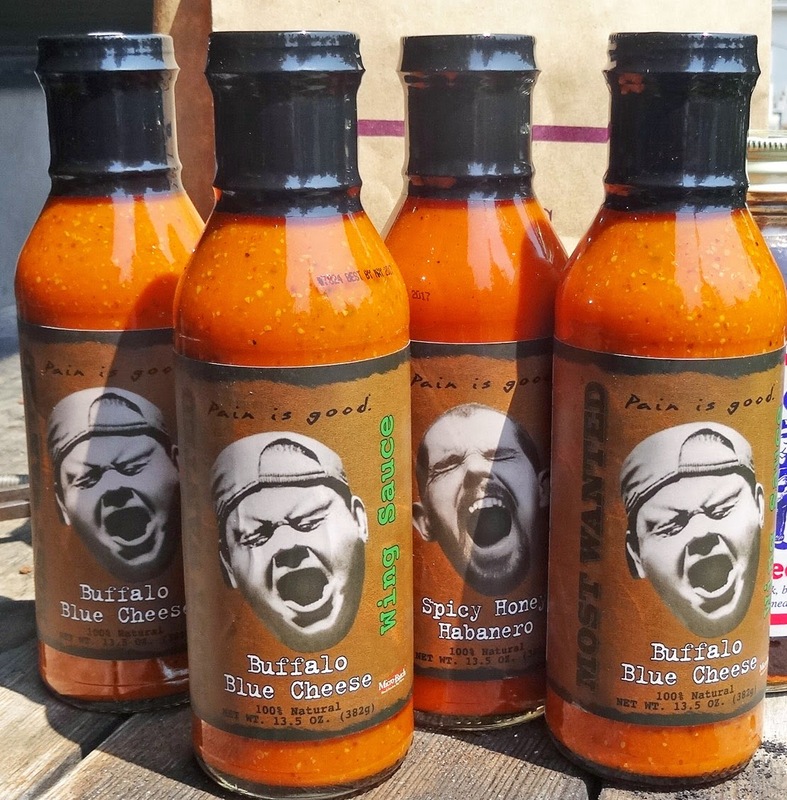 This was a traditional buffalo style wing sauce with the addition of blue cheese. It has mild vinegar twang to boot. Ms. Goofy was in chicken wing heaven. I enjoyed them too. Winner, winner, chicken wing dinner! 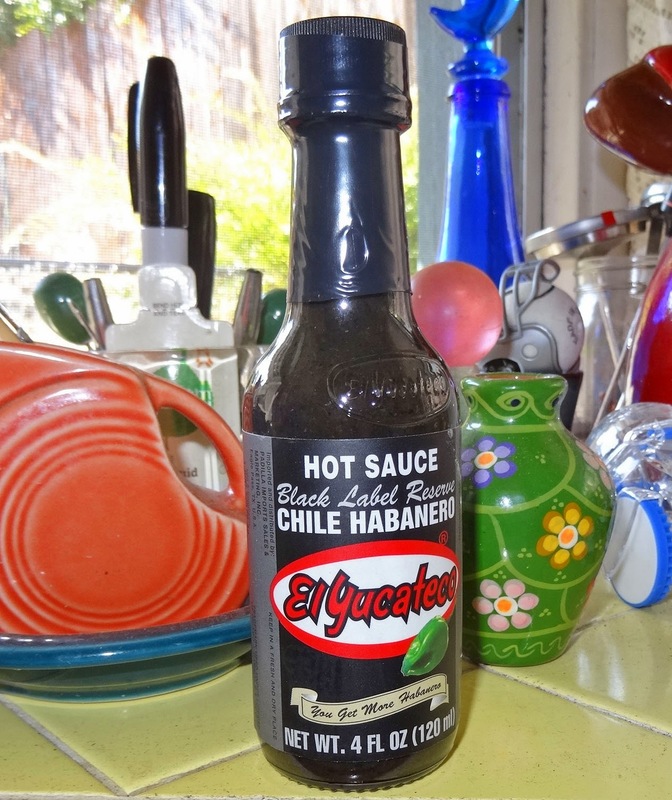 El Yucateco is a brand of hot sauces that is a staple condiment in homes and restaurants throughout the country. When they released their new sauce 'Black Label Reserve', this Chilehead got excited. I ordered a bottle immediately and would like to share my initial thoughts and observations. 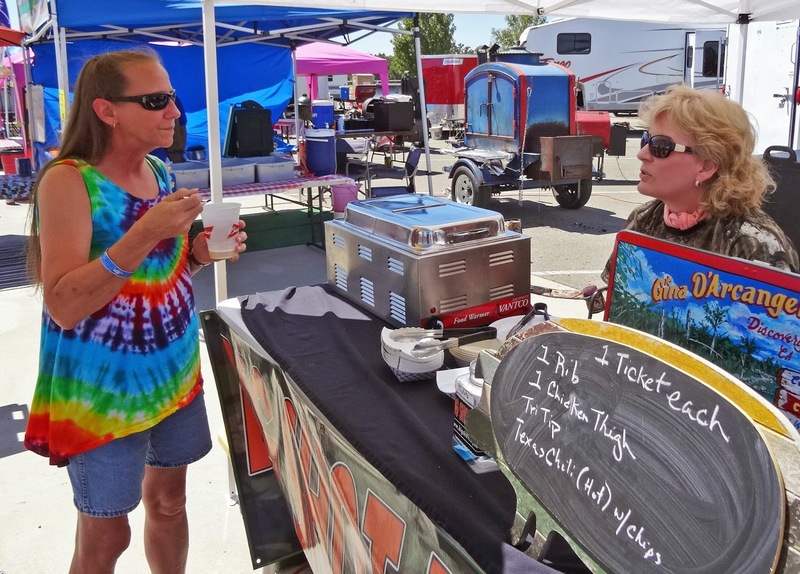 It was so hot that; (insert punchline here) Oh boy, was it a scorcher for the third round of the North State BBQ Championship. The temperature was attempting to break the century mark yesterday. If you could find shade it was prudent to stay put. The judges tent was open aired and we had a very large fan but it was still a challenge. 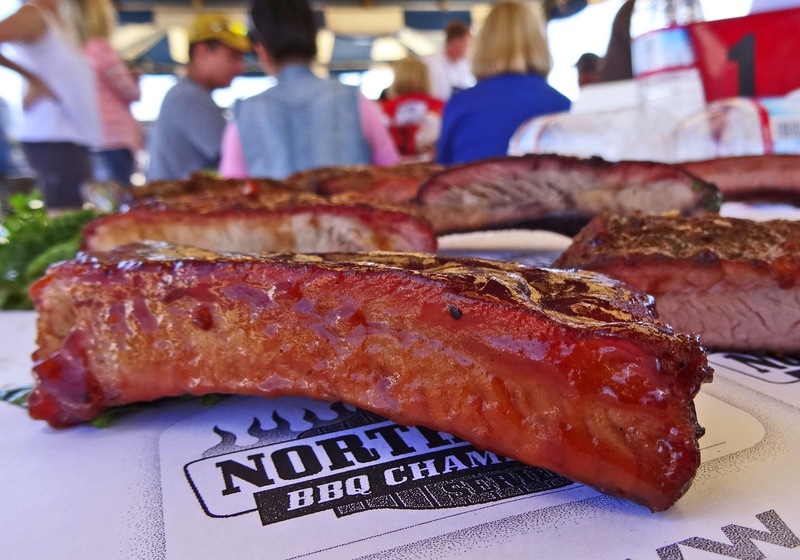 We acclimated the best we could and were rewarded with some great bbq to sample and score. Chicken, Tri-tip and pork ribs was on the menu today. This 'Klose' smoker rig definitely caught my attention. This is the Cadillac of 'stick burners. 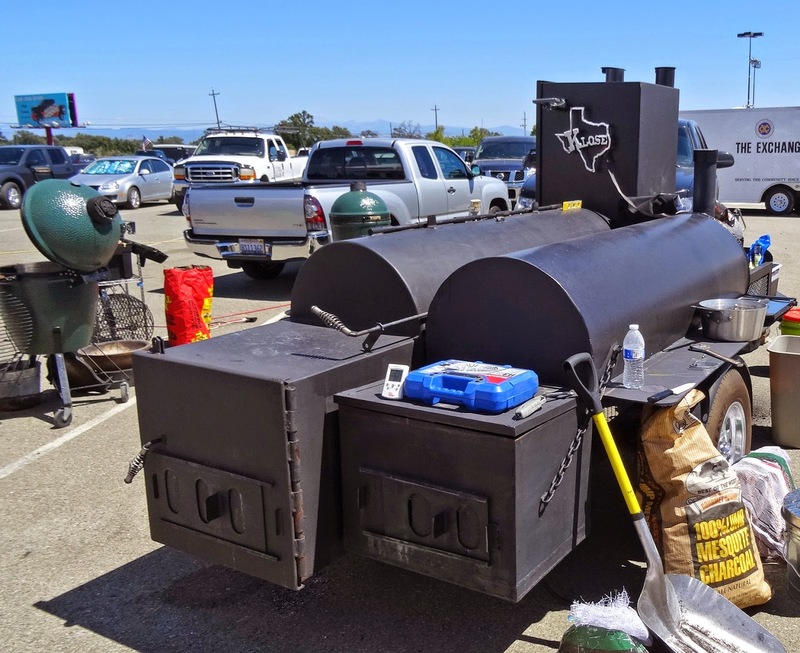 A stick burner is a bbq rig that is fueled by wood. This may be bbq in its purest form. You may notice how small and insignificant the Big Green Egg looks next to this beautiful smoker. (I apologize if I offended any BGE fans). Someday, maybe, I can dream you know, I may own a Klose. It is always a blast to hang out with the bbq family. Great food and friends make for a wonderful weekend. 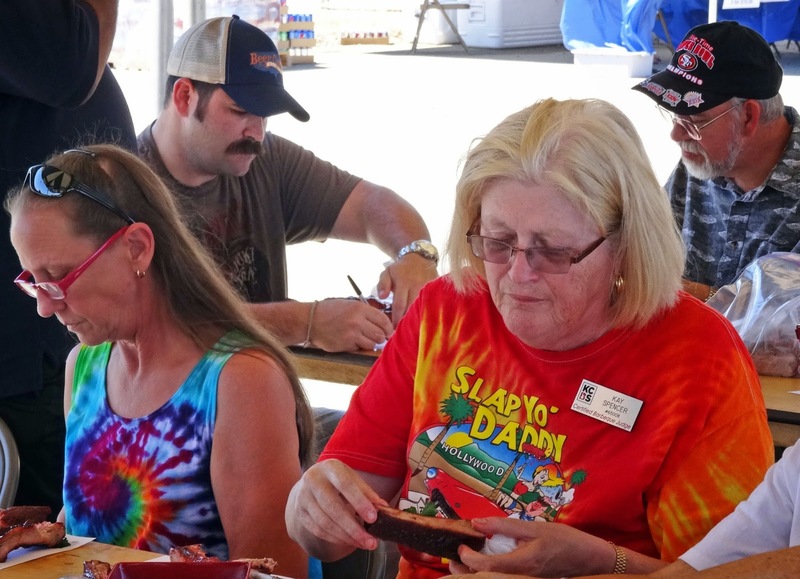 Gina and Jack of 'Big Shot' bbq was crowned Grand Champions of this contest.. Gina is not only a great bbq competitor but is also a champion chili competitor. This image she is sharing some of her award winning chili. 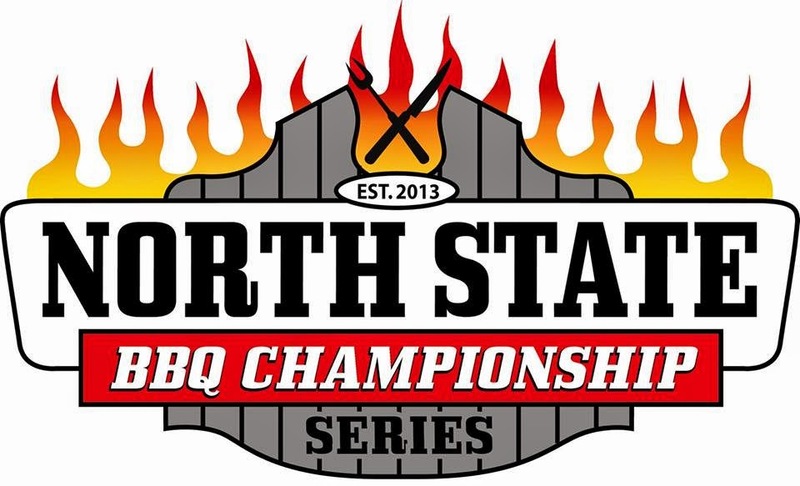 We have a week to re hydrate and prepare for the next bbq competition. It is a tough job but that is the way we roll. What fun!!!!!!!!! 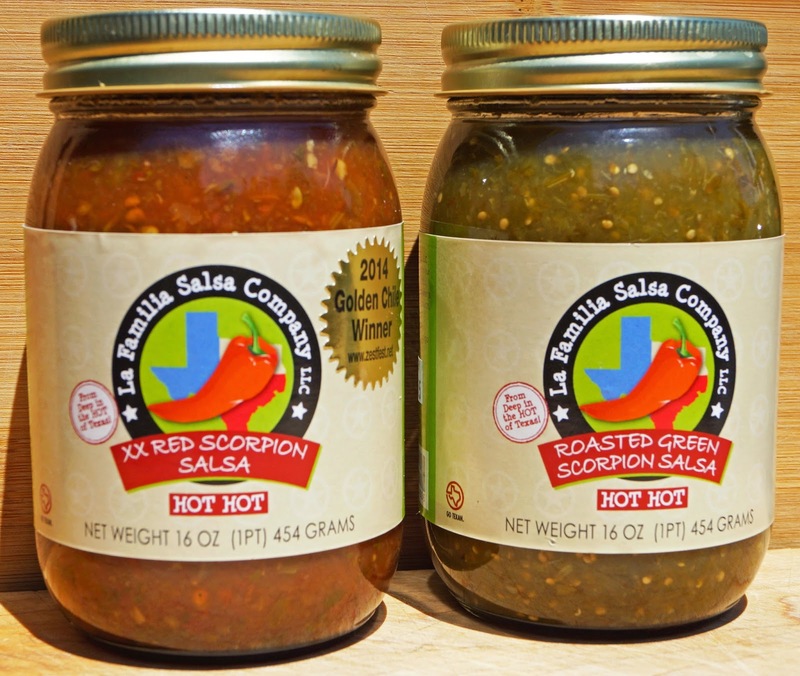 We review two heavy hitting salsas that are fueled by the exotic Moruga Scorpion peppers. These peppers sting and bite heat that will humble the bravest Chilehead. Read our latest review by the link below. The label is scary and a little bit creepy. 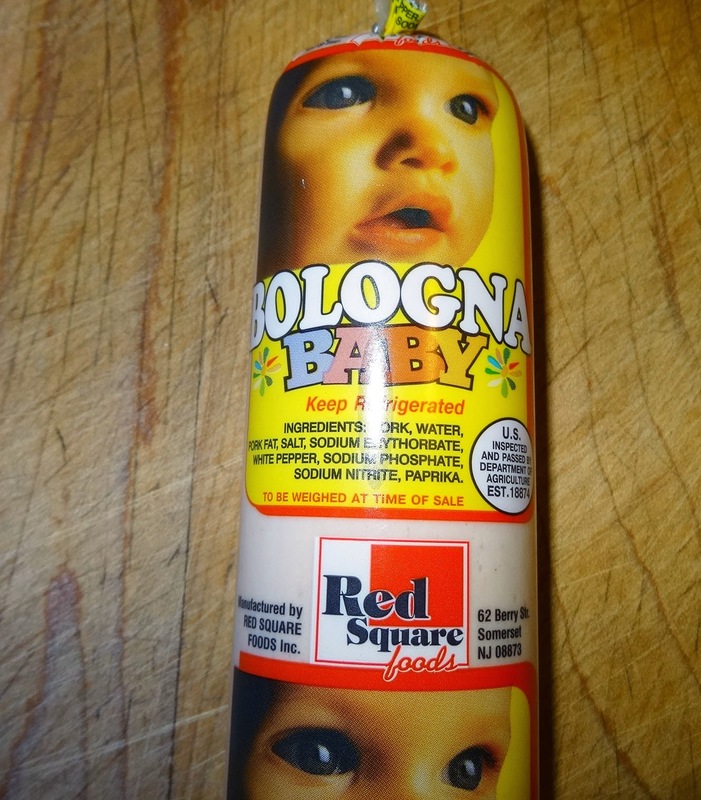 Is this bologna made for babies or just called baby for its size? We are not sure and there is not a whole lot of information about this product. Bologna is only a distant memory from grade school sandwiches. If memory serves me correctly I was not a big fan back then. This will be a challenge because I am not sure what good bologna tastes like. 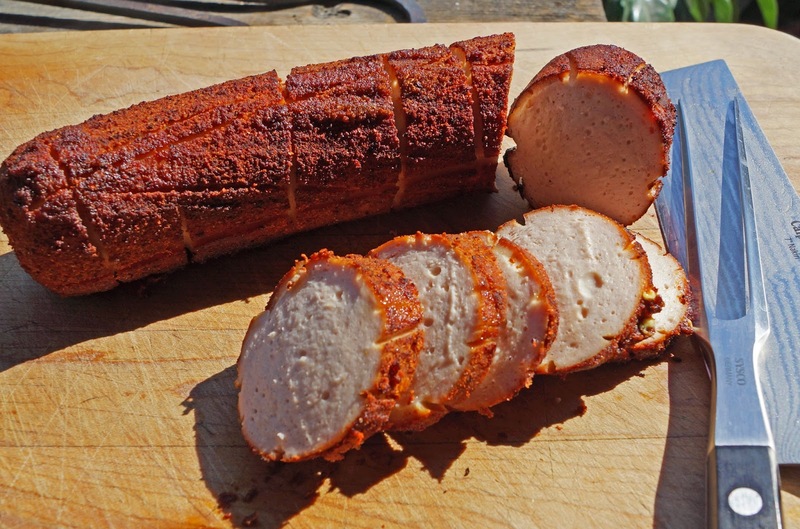 Today, we are going to season and smoke our 'Bologna Baby' on the Weber Smokey Mountain Cooker. Is there such thing as a good tasting bologna? We shall see. The scary wrapper was removed. The meat tube revealed was as pale as a babies behind. (So sorry, I could not resist.) 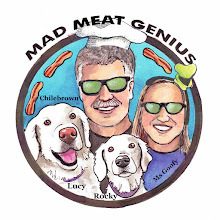 We scored the sausage and applied a spicy rub. The smoker was fueled with hickory wood for flavor. The bologna was smoked for about an hour and one half. This allowed enough time for the smoke to gently kiss the surface and heat the bologna through. You may notice in the image we also made some bacon wrapped cream cheese filled jalapeno poppers. (ABT's). The rendering bacon added a little extra love to our Bologna Baby. Well, here comes the million dollar question; how did it taste? This tasted like a very mild hot dog. 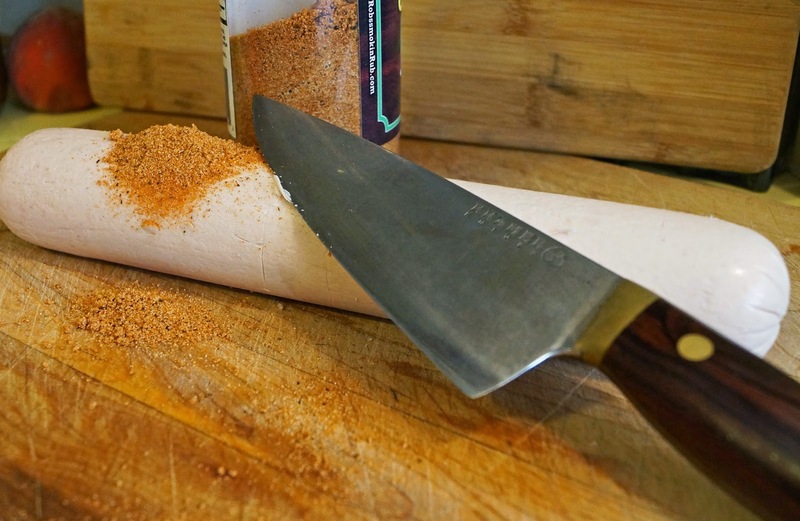 The rub added a spicy element that was a welcome addition to this bland meat. Smoke was present coaxing some much needed flavor. The texture was soft like the bologna I remember. Was it good? Let's just say it was not bad. If you are a fan of bologna maybe this is for you. This was a one time adventure that we wanted to share with you. I have a lot of smoked balogna leftover and really have no desire for a sandwich. Oh well. You thought Sharnado was scary, 'Balogna Baby' may be the next scary phenom. Our bbq competitor friend Jon from 'Pork Dynasty' pointed us in the direction of this food product. I say food product with a little hesitation. You can enlarge the image above to access the ingredient list but do so at your own risk. In the name of research for the Mad Meat Genius readers we will try this 'Balogna Baby'. Stay tuned and be afraid my friends. This should be a fun one. 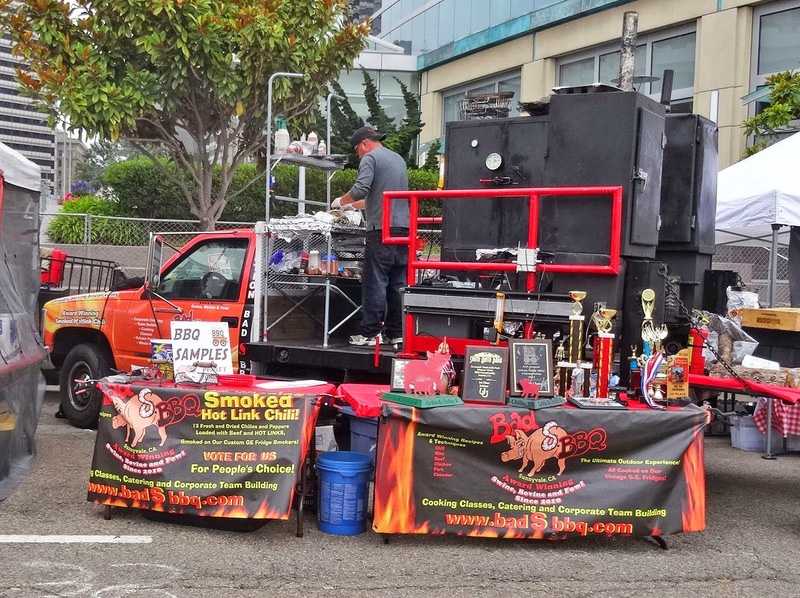 Cars and bbq will be the theme at this festival located in the corn growing region of Brentwood, California. Hope to see you there. We are in downtown Oakland for the "Art & Soul Festival'. 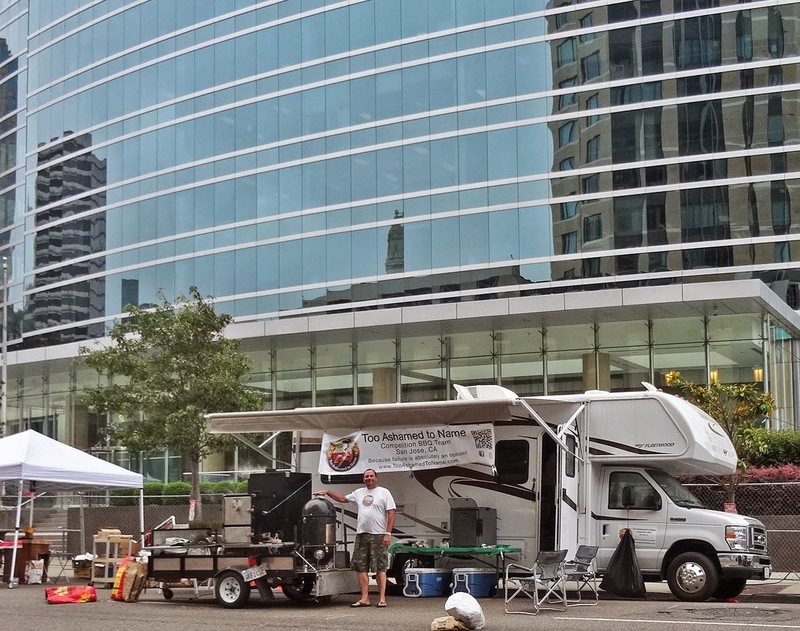 Two days of music, crafts and good eats was the goal of this festival.. Saturday two separate bbq contests were held amongst the towering skyscrapers of this colorful metropolis. The heavy hitters, the Pro division cooked the four meats; chicken, ribs, pork shoulder and brisket. The 'Backyard Division cooked tri-tip, ribs, and chicken. 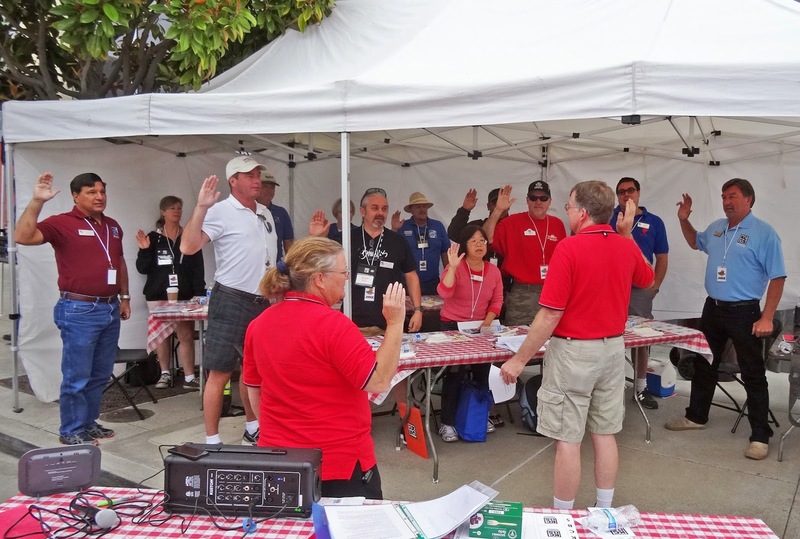 We are present with our shiny judges badges ready to serve and protect the integrity of good bbq. There was an auxiliary category of desserts that both divisions were eligible to compete. Ms. Goofy drew the lucky straw and won a chair to judge the dessert division. I got the short straw and had the duty of Table Captain. The Table Captain presents the desserts to the judges and compiles the scores. The Captain does not taste the entries unless there are extras. I only got to drool at cheesecake (1st place with an 180 score), pecan pie, pineapple upside down cake, etc., and even chocolate covered bacon. After our judging duties we strolled the grounds and enjoyed the sites. We caught up and visited with our competitor friends. Harry Soo, a celebrity pit master was in the house today. 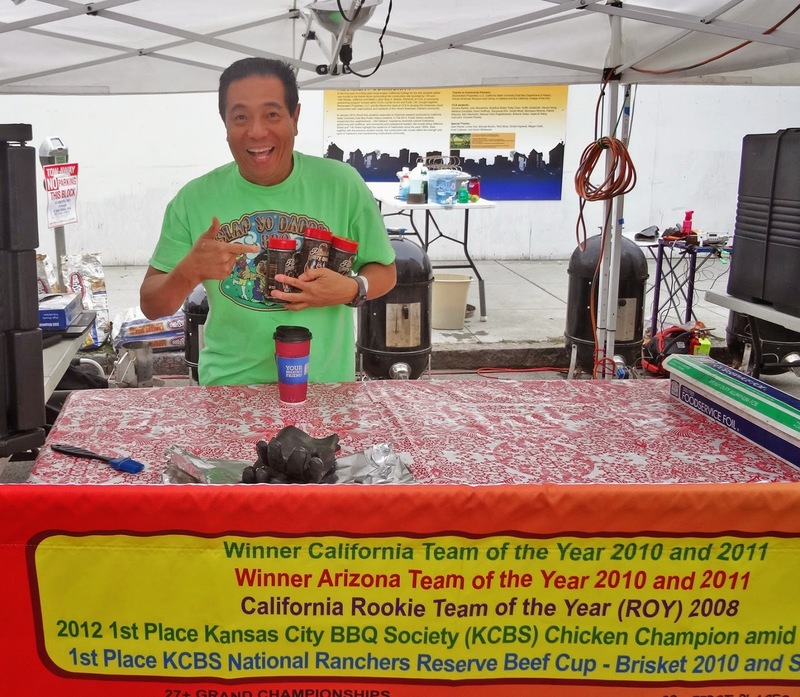 He is selling his new line of bbq rubs and was enthusiastic to promote them. 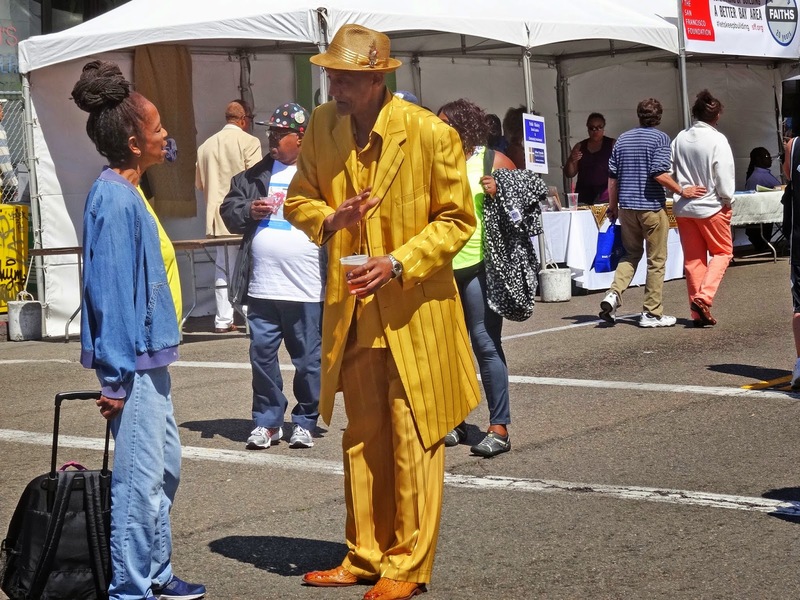 The Oakland Art & Soul Festival was an event Oakland can be proud of. We witnessed a lot of happy event goers. We could see their smiles under the bbq sauce covered faces. Our faces had smidgens of bbq sauce too. Ms. Goofy's grin might of been the biggest after eating all those desserts. This beautiful slab was found at 'Bud's Meats' in Penngrove California. Look at the meat to fat ratio. This is one meaty hunk of cured swine. The smoke is slight but present. Salt and sugar are in balance. The only fault I can find in this specimen is the rind is on. It may be a minor inconvenience but when removed you are also losing a sliver of possible smoke flavor. In my opinion: rind on is just plain wrong. The flavor is very meaty with porky goodness. 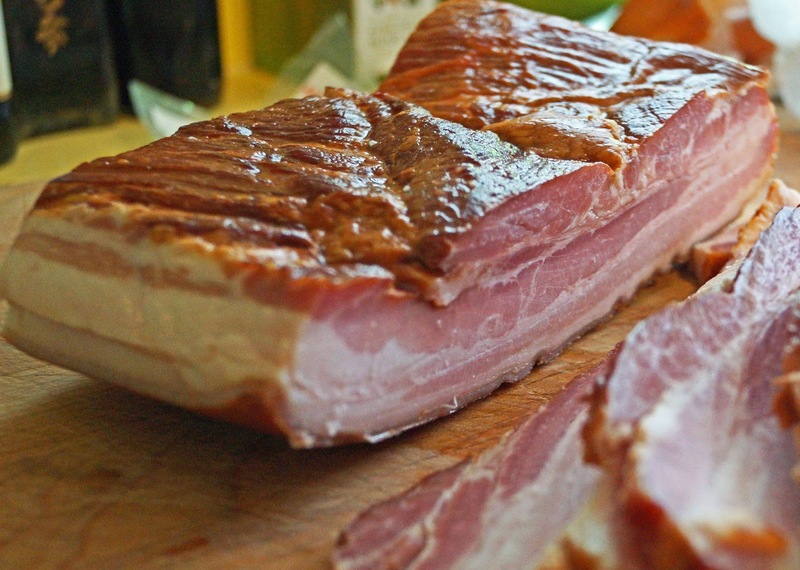 This bacon makes Meat Adventures worthwhile. Lately, we have been enjoying bacon, lettuce and tomato sandwiches. The tomato's are ripe and with the addition of this fantastic bacon, we have sandwich perfection. Today we are having some fun by making a bacon pizza. We bought some convenient tasty pizza dough from the Berkeley Bowl West. A quick sauce was made from our vine ripe tomato's. 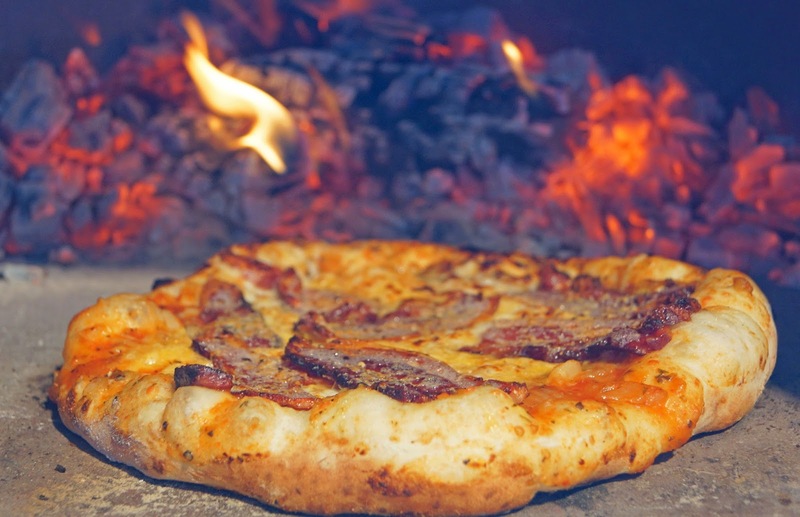 We partially cooked the bacon to ensure crispness before we placed them on sauced and three cheese assembled pie.. A quick trip to our ultra hot wood fired beehive oven and we were in business. This was a fun dinner.